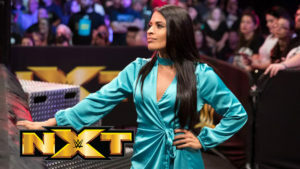 Lana drives Zelina Vega into the corner. Lana lands a few shoulder block. Vega decks Lana. Vega rolls out of the ring. Lana baseball slides Vega. Lana brings Vega back into the ring. Vega unleashes a flurry of strikes. Vega puts Lana in a rear chin lock. Vega slams Lana to the mat. Ax kick by Vega. Lana catches Vega with a knee followed by a snap suplex. Vega kicks out. Lana drops multiple elbows on Vega. Running bulldog by Lana. Vega kicks out again. Lana suplexes Vega multiple times. Almas gets on the apron. Vega jawbreakers Lana. Rusev runs over Almas with a clothesline. Rusev sends Almas into the barricade. After a distraction by Vega, Almas attacks Rusev from behind. Lana goes up top. English runs down and tries to help Rusev but English sents Almas into Lana. Lana falls off the top. Vega hits Meteora for the win.